The use of nutraceuticals as protection drugs against chronic diseases gained a vast success. Many studies found that nutraceuticals may reduce the tumorigenic actions of carcinogens, inhibiting the adhesion and proliferation of tumor cells. Genistein is a natural isoflavone preventing osteoporosis, menopause problems and heart diseases. It is also known in China and Japan for its anticancer properties. The available treatment protocols for Head and neck squamous cell cancer (HNSCC) have led to poor results and new therapies are necessary. 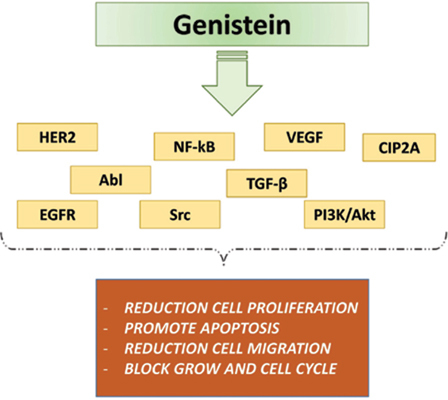 In this paper, we will review anticancer therapeutic potential of genistein and in vitro and in vivo studies that suggest its potential role in the treatments of HNSCC. Genistein, HNSCC, Nutraceuticals, Isoflavone, Therapy, OSCC.